As Makeup plays an important role in glamorizing the look of a person. It is always a great desire of every woman to look her best on her special day. From the elaborate and traditional, to the trendy and quirky, our experienced hands can give any twist to your tresses. 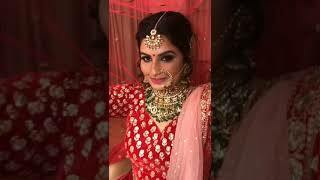 Sohni Juneja provides hair style & hair extension service from eccentric to knotty, to cultural and with latest tradition, you can get adorable look so that every eye can appreciate your look on the big day. Sohni Juneja is a renowned professional makeup artist in India. Having enormous knowledge about makeup and styling, she very well knows how to give attractive and charming look to her clients. She has been involved in providing her services of makeover to some well known T.V artists as well as celebs. She is successfully transforming lives of the women by making them beautiful. appointment with Best wedding Makeup Artist in Delhi.